The Dodge Challenger SRT8 392, a treasured American sports car, is reminiscent of the past but has an eye for the future. With 470 horsepower and an incredible Hemi soundtrack, the Challenger has a raw, visceral appeal. The newest, most powerful Challenger is equipped with a 6.4-liter V8 producing plenty of get-up-and-go for most sports car drivers. Along with its power, the Challenger is set apart by its impressive speed, burning rubber as it zips to 60 mph in just 4.5 seconds. While the Challenger is undoubtedly a 70s-inspired car, it also has plenty of modern features to please today’s car lovers. In many ways, the Challenger remains the leader among American sports cars in comfort and convenience. The Challenger is likely to impress passengers with its relatively large interior space, quality materials, and ample technology features. And for 2012, drivers will also appreciate the much-needed boost in fuel economy. 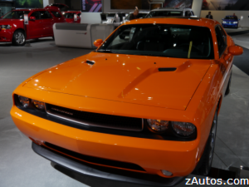 Visit zAutos.com for a full review on the 2012 Dodge Challenger SRT8 392. On the site, viewers will find a complete source of information on the special Challenger, including fuel and safety stats, performance data, over 80 images, and a list of standard and optional features for the car. Click on the “Car Reviews” tab on the zAutos.com homepage to find hundreds of other car reviews. Along with providing in-depth car reviews, the consumer car research portal offers over 4,000 instructional car videos and 10,000 vehicle eBrochures. Visitors to the site can customize their own vehicle with the new Build a Car application or search for over one million pre-owned cars for sale with the used car search tool. The website also follows the latest auto news that affects consumers. The newest feature on zAutos.com is the Car Concierge, which guides consumers step-by-step through the car selection process. Whether searching for a new vehicle or catching up on the latest developments in the automotive industry, zAutos is a consumer’s go-to resource for auto information on the web.